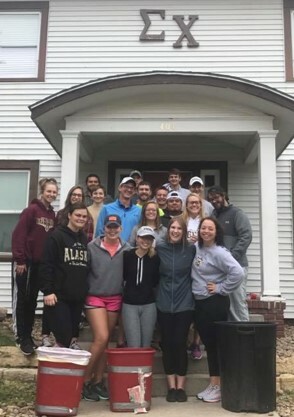 Fraternity and sorority life at Fort Hays State University embrace five community pillars: Social, Academic, Empowerment, Leadership, and Service. These pillars guide our organizations to enhance our community, university, and members. Fraternities and sororities foster lifelong friendships through social interactions, such as meetings, socials, mixers, and formals. Plus, members of fraternities and sororities are connected to the thousands of others across North America. Friendships created during your time at FHSU do not end upon graduation. Alumni take an active role in helping their chapters throughout the year, attending homecoming events, and conventions. Academics are one of the most important aspects of your life at FHSU and being a member of a fraternity or sorority can help you achieve your goal of obtaining a degree. Each chapter has a study program which aids you in obtaining high scholastic achievement. In fact, the overall fraternity/sorority GPAs are usually higher than the all-women's or all-men's GPAs. Every year our chapters, recognize individual members for their academic excellence and many are eligible for scholarship money from chapters at both local and national levels. College is an opportunity to become the best version of yourself. Fraternities and sororities will empower you to accept challenges, develop healthy habits, and succeed. Challenges appear in all aspects of our lives. Fraternity and sorority life will empower you to accept those challenges and give you the tools to solve them. Dealing with the stress of college can be difficult. Members are provided education on study techniques, time management, and proper alcohol consumption. Finally, we will empower you to succeed by helping you every step of the way. We are confident in your ability and when you succeed, we succeed. Involvement provides many opportunities to hold leadership positions and gain valuable experiences within the campus and local communities. Each fraternity or sorority depends upon its members to accept leadership opportunities within committees, as a chairperson or as an executive officer. These opportunities are an excellent way to gain new skills like learning how to manage money, dealing with conflict, communicating effectively with others, all while building your self-confidence. Membership in a fraternity/sorority will provide you an experience which will benefit you for life. Members of each fraternity/sorority at FHSU contribute to the campus, Hays, and global community through the giving of their own time and talents. As a member, you will assist in raising money for local and national philanthropic organizations. You will have the opportunity to give of your time through service to an individual, organization or the community; and you will have the opportunity partner with other FHSU student organizations or departments on a variety of volunteer activities and projects. Greek Life is for You! As a member of a fraternity or sorority, you will find your own way to contribute to a chapter whether it is excellence in academics, athletics, or campus activities. At FHSU we are positive that you have something to contribute and gain from Greek Life!